Scotland is a land of legends, from kelpies (water-horses) to faeries and giants to selkies (seal-folk); there are no shortage of stories about supernatural creatures which thrived in the wild and untamed Scottish landscape in times gone by. Possibly the most famous of all these beings is Nessitera rhombopteryx who some believe still resides in the one of Scotland’s largest, deepest, fresh water lochs, right in the heart of the Highlands. Famous? Then why haven’t you heard about this legendary entity? Ah, but you have, possibly by one of her other, more common, names. For the creature of which I speak is the notorious Loch Ness Monster, more affectionately referred to as Nessie! The first recorded sighting of a monster living in the area of Loch Ness was over 15 hundred years ago, when Irish monk St Columba was visiting the Pictish shores. After having sent one of his followers into the water to attract the ‘water beast’ he demonstrated the power of his God by commanding the creature to break off his attack and caused it to flee in terror! Fast forwarding to the beginning of the 20th century, further interest was sparked when George Spicer and his wife saw what they described as ‘a most extraordinary animal’ cross the road in front of their car and disappear into the Loch. The sighting lead to numerous ‘hunting’ parties visiting the loch over the following few years determined to catch the monster ‘dead or alive’. It was at this time that the well known ‘Surgeons photograph’ was taken, which has now been exposed as a hoax. 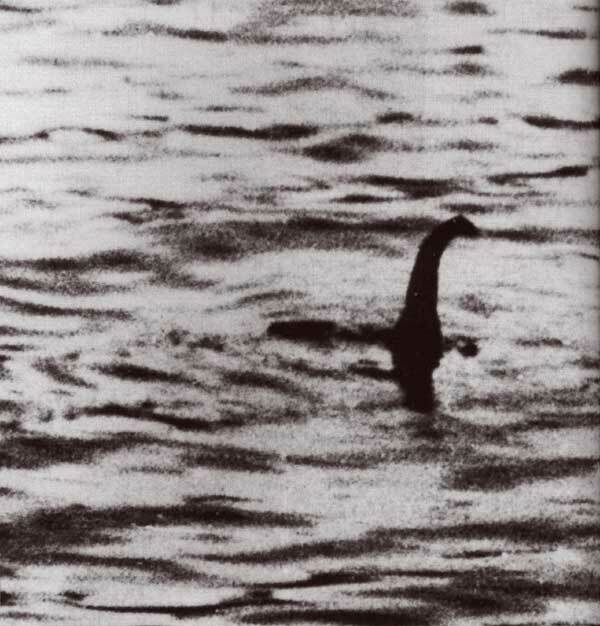 However in 1938 a South African tourist called G. E. Taylor made a 3 minute recording on 16mm colour film of the elusive creature, and although only a single frame was ever made publicly available, experts have said that it is ‘positive evidence’ of Nessie’s existence. In 1943 the monster was seen again by C. B. Farrel of the Royal Observer Corps as he carried out his duties on the Loch. He described a finned creature with large eyes and a neck that protruded 4-5 feet out of the waters. 11 years later, the crew of a fishing boat called the Rival III reported sonar readings of a large object at a depth of 480 feet keeping pace with them for approximately half a mile as they sailed across the loch. In 1960 the monster was again caught on film by Tim Dinsdale, which, when digitally enhanced in 1993, showed a creature with rear flippers and a plesiosaur-like body (plesiosaurs were carnivorous aquatic reptiles which lived at the end of the Triassic Period). Sceptics have said that due to the poor quality of the film, these features could have been created by tricks of the light as it reflected on the water, but no one really knows. Just 4 years ago the monster appeared on film again, when Gordon Holmes videoed a jet black ‘thing’, about 45 feet long, moving quickly through the loch waters, but because the footage did not include anything which could be used as a scale comparison, once again it can not be classed as definitive proof. So, the legend remains just that! There is no undisputed verification of the existence of a monster living in the waters of Loch Ness, but then again, there is no sure proof that there is not! Perhaps, sometime soon, someone will get the evidence that Nessie isn’t just a myth or tale, but rather another example of how the unique, unspoilt landscape of Scotland supports species that have been long extinct elsewhere. If you fancy taking on the challenge and take part in a bit of Nessie spotting then Unique Cottages has a selection of cottages close to Loch Ness, including two where you can actually see a great length of the loch from the window! I miss my bonnie Scotland so much!